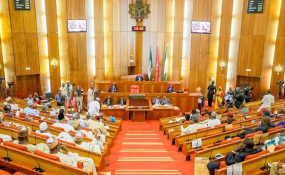 The Nigerian Senate on Tuesday resumed plenary after recess its recess which lasted over two months. It had suspended plenary on July 24 and was scheduled to resume on September 25 but the Clerk to the National Assembly in a letter, announced the postponement of resumption to October 9. Upon its resumption on Tuesday, the Senate President, Bukola Saraki, led the prayers at about 11:06 a.m. and the Senate went into a closed door session thereafter. Nigerians have anticipated the Senate's resumption as many believe there are pressing issues to be tackled by the lawmakers. PREMIUM TIMES earlier reviewed some of the key issues including the budget for the electoral commission, INEC, and whether the ruling party, APC, can successfully remove Mr Saraki who defected to the opposition PDP a few months ago.